If your significant other is anything like me, he'll be notoriously difficult to shop for. If that's the case, you might approach Christmas shopping with a feeling of trepidation. This year, I'm shopping for my husband which, really, isn't any different to shopping for my fiance, and before that, my boyfriend. It's still really difficult though, and I'm always on the lookout for gift ideas for my significant other. It occurred to me that I can't be the only one in this position, with Christmas fast approaching, so today I'm sharing with you some great gift ideas for the special man in your life. Whether it's your husband, fiance, boyfriend or father; I'm sure you'll find something in this guide to help ease your shopping woes! The Panasonic i-Shaper 3-in-1 Precision Trimmer is the perfect male grooming gift! This men's trimmer has three functions, allowing the user to style, trim and shave with a new level of precision. The Detail attachment allows for precise styling, even in hard-to-reach areas like cheeks or jaw. With the Trimming attachment, you get 20 different cutting lengths to ensure an easy and clean trim to any desired style. With an ergonomic, easy-to-use design, this device allows for stylish and original beard shapes for a variety of styles. Need some inspiration? Check out this article for the hottest beard styles for 2017! And finally, the Shave attachment allows for a quick, dry shave with a blade that is gentle to skin. The rounded edges of the blade make for minimal contact with the skin, whilst the narrow gaps on the blade protect the skin from harm. Not only is this trimmer convenient and easy-to-use, it comes with a washable blade that will last for an exceptional three years. This ensures an easier maintenance, and far less frequent blade replacement. It really is the gift that keeps on giving! The Panasonic i-Shaper 3-in-1 Precision Trimmer is available for just £99.99 from Boots, Argos, Very and Amazon! If you're planning to give this men's trimmer as a gift this Christmas, why not print out this article to go along with it? The 12 Habits of Impeccably-groomed Men gives some really useful advice on getting the best shave, managing your facial fuzz and more. It's a comprehensive guide to being the best when it comes to male grooming, and I'm sure the special man in your life will appreciate the advice! You can now watch a review of Panasonic's ER-GD60 Trimmer on Youtube. To find out more about the trimmer, and why it would make a perfect Christmas gift for the special man in your life, watch the video here. Maybe you have a coffee loving male in your life. Does your husband survive on coffee? Or maybe your father can't start the day without a good cup of joe? Then this Gift Hamper for Guys might just be the perfect gift! The luxury natural wicker hamper gift basket includes; an insulated travel mug, 500g Caffe Roma Italian Ground Coffee, 227g Rombouts Ground Coffee, Chocolate Coated Espresso Beans, Hot Chocolate sachets, and a handwritten gift tag for your personalised message. All this for just £22.98? This really is the perfect gift for the coffee loving man in your life. If you and your significant other have an unusual sense of humour (as my husband and I do!) then a novelty gift like these Bike Balls might make the perfect stocking filler. 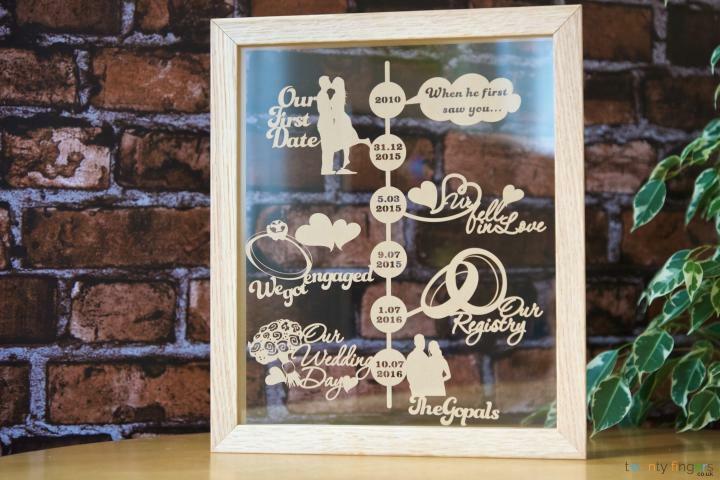 Or if you're looking for something more sentimental, more heartfelt, why not try a Papercut from Twenty Fingers? 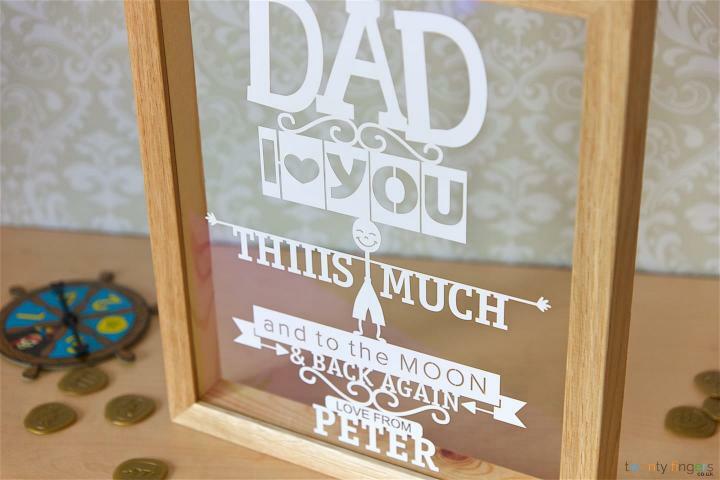 Whether it's the "Story of Us" Papercut to celebrate your relationship, or a "Dad I Love You So Much" Papercut (see below), Twenty Fingers have a wide selection of products to choose from. And because they can be personalised, they make the perfect, most thoughtful gift at any time of the year! It's safe to say that everyone will have a man in their life who considers themselves to be King of the Barbecue. So why don't you show them how much your appreciate their skills with a Personalised Barbecue Tool Set? This comprehensive fourteen piece barbecue set includes a spatula, fork, BBQ cleaning brush, tongs, kebab skewers x 2, and corn forks x 8. The set is topped off with a personalised Bar Blade bottle opener. All the items are presented in a storage case, with the option to personalise some of the tools. A perfect gift for the BBQ King in your life! Please leave your gift ideas for men in the comments below, I need all the help I can get this year! The hamper would go down well with my fiance.. he loves his coffee. Ooh a great idea then! Great ideas! Especially if they have a cheeky sense of humour!